To celebrate its 80th anniversary looking to the future, Pininfarina has unveiled the Nido EV, the first running prototype of the “Nido Development Programme”, the project for an electric car conceived, designed and built entirely by the Pininfarina Style and Engineering Centre of Cambiano (Turin). Pininfarina is celebrating an anniversary full of novelties. To celebrate 80 years of activity, at the company headquarters in Cambiano, Turin, Chairman Paolo Pininfarina and CEO Silvio Pietro Angori have just inaugurate the Pininfarina Collection, an exhibition of models that have made the brand’s history. In the presence of Cabinet Undersecretary Gianni Letta, Foreign Secretary Franco Frattini, the Chairman of the Turin Industrialists’ Union Gianfranco Carbonato, Ferrari Chairman Luca Cordero di Montezemolo and designer Chris Bangle, the Nido EV, a prototype electric car conceived, designed and built entirely by Pininfarina, was unveiled for the first time, and a new book, “Pininfarina” by Decio Giulio Riccardo Carugati (Electa), will be launched. Last Saturday exactly 80 years passed since May 22, 1930, the day when Battista “Pinin” Farina (the surname Farina was changed to Pininfarina in 1961 by Presidential Decree) signed the deed founding Società Anonima Carrozzeria Pinin Farina in Turin. Through a long process of growth and transformation, ideas and creativity, often ahead of its times and adapting to the deep social, economic and technological changes that have taken place in 80 years, Pininfarina has evolved from an artisan concern to an international group that is a worthy global partner to the motor industry. Today Pininfarina, which has been listed on the Stock Exchange since 1986, has offices in Italy, Germany, Sweden, Morocco, China and the United States. The company’s automotive clients include prestigious brands like Ferrari, Maserati, Alfa Romeo, Ford, Volvo, Tata Motors and Chery. Over the years, important partnerships have also been developed in other sectors, with clients such as Ansaldobreda, Eurostar, Iveco and Prinoth. The Pininfarina Extra company was founded more than 20 years ago, specialising in product and interior design, architecture, sailing and aircraft, with over 400 projects to its name. Many of Pininfarina’s creations have entered prestigious national and international museum collections like the MoMA of New York, which has had a Cisitalia 202 Berlinetta on display since the 1940s. Pininfarina design has received endless awards in its 80-year history, the most recent being: the “Louis Vuitton Classic Concept award” for the Maserati Birdcage 75th, the “red dot award 2008” for the Sintesi; the “Compasso d’Oro 2008” for the Nido, and the Trophée du Design as the best designer of 2009. Sergio and Battista “Pinin” Farina have both entered the famous European Automotive Hall of Fame, an institution created to celebrate the men who have made motoring history. The Pininfarina Collection is being inaugurated as the custodian of company values, highlighting the cornerstones of Pininfarina design, exhibited on a rotation basis in a space that is deliberately kept small to highlight the quality of the items on show: it is a selection of historical cars, one-off models, small production runs and mass-produced models, styling models and research prototypes, each with a specific creative, technical and industrial significance. The restyling of the Collection was the work of Pininfarina Extra as part of the strategy to raise the prestige of the brand still higher. A show window will display awards won by the company, publications illustrating its history, items recently designed for its clients by Pininfarina Extra and exclusive articles that can only be found in the Pininfarina Collection. Pininfarina’s most recent product, the 2uettottanta, a 2-seater open sports car that was presented at the 2010 Geneva Motor Show, is positioned at the centre of the exhibition area, surrounded by milestones like the Cisitalia 202 and the Lancia Aurelia B24. The 2uettottanta also graces the cover of the new book “Pininfarina” (Electa), which has been presented by its author Decio Giulio Riccardo Carugati. The book traces the entire evolutionary process of Pininfarina design through the cars (one-offs, mass-produced models, research prototypes) that have made the company an undisputed icon, the protagonist of the Italian styling world and an example of the most prestigious Italian products. To celebrate its 80th anniversary looking to the future, Pininfarina has unveiled the Nido EV, the first running prototype of the “Nido Development Programme”, the project for an electric car conceived, designed and built entirely by the Pininfarina Style and Engineering Centre of Cambiano (Turin). The Nido EV bears witness to the skills and experience that Pininfarina has built up in the development of electric vehicles, paying particular attention to the Segment A city cars that will populate the streets of the future to make our towns more pleasant to live in. 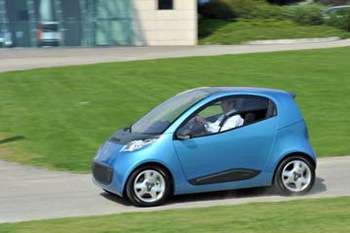 The Nido EV is one outcome of the pioneering, far-sighted decision taken by Pininfarina three years ago, to focus on sustainable mobility, approaching it from various angles: not only the adoption of a hybrid or electric driveline, but also research focusing on reducing consumption and “wheel to wheel” emissions, the use of alternative materials that are lighter and recyclable, active and passive safety, and IT, which will have to combine the sustainable use of means of transport with intelligent traffic management. The exterior design of the Nido EV takes up and updates the lines and volumes that won the Nido of 2004 the award for the Most Beautiful Car in the World in the Prototypes and concept cars category, the Compasso d’Oro 2008 and a place in the temple of modern art, the MoMA of New York. The Nido EV is a veritable laboratory designed both to explore the electrification of a small city car and to develop a modular floorpan. Pininfarina was the first industrial company in Italy, and one of the first in Europe, to propose a project for a 100% electric car, in collaboration with the French company Bolloré. Today, when all the large carmakers view the electric car as an opportunity, Pininfarina goes a step further, promoting a philosophy that incorporates the choice of individual and collective electric transport in the context of a new lifestyle that everyone should adopt in order to increase energy saving and protect the planet. This is why sustainable mobility has become one of the pillars underpinning the company’s industrial plan. And it is why Pininfarina celebrates its 80th anniversary with the presentation of the Nido EV project which, in parallel to the BlueCar developed with Bolloré, underlines the company’s determination to become the benchmark in Italy, and further afield, where sustainable mobility is concerned, just as it has been a global benchmark where style is concerned for the last 80 years.